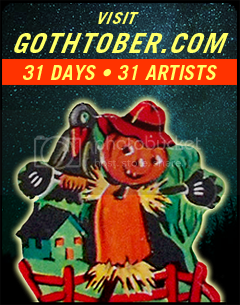 Visit www.gothtober.com and click on Day 14 for the most helpful advice you’ll get this year! Ian MacKinnan’s coven of witchy sisters are going to guide you toward greatness, if only you’ll listen to their common sense wisdom! Each of them is over 500 years old, so if you think better… Witch Please, think again! Studies have shown that regular humans like us can gain infinite knowledge from the centuries of experience our dear majikal wimmin sisters have gleaned. If you don’t like what they are saying, don’t be too vocal about it, they can say incantations that make you grow hair on your eyeballs, it’s best that you not explore their wrath! We think you’ll find that if you apply these helpful bits of learning to your life lexicon, you will achieve a level of balance that was thought to be long lost, according to legendary lore.